INDUSTRY.co.id - Jakarta - Minister of Industry (Menperin), Airlangga Hartarto was awarded the 56th Lee Kuan Yew Exchange Fellow (LKY Fellow). Award in the form of gold medal is submitted directly by Chairman of the LKY Fellow, Eddie Teo. "Alhamdulillah, I am grateful and grateful for this award," said Minister of Industry, Airlangga Hartarto through his written statement in Jakarta (11/09/2017). According to Eddie Teo, this award has been running since 1991 to individuals around the world who have been selected based on their track record and the tremendous potential to contribute to their country and establish good bilateral relations with Singapore. This award has also been given to Indonesian leaders, including Sri Mulyani in 2003 and Kuntoro Mangkusubroto in 2006. 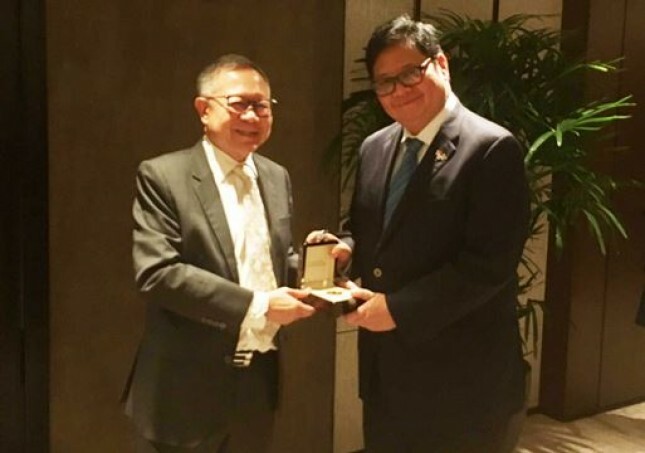 "LKY Fellow is given to Mr. Airlangga for being able to transform the priority of vocational education based industry development that strengthens the relationship between Indonesia and Singapore," he explained. Eddie Teo also mentioned several strong reasons for his giving LKY Fellow Award to Menperin Airlangga, including his involvement in the Singapore-Indonesia Leaders' Retreat and his contribution in the vital projects of both countries, such as the MoU of cooperation in the field of education and training of industrial vocations between the Ministries RI Industry with Ministry of Education (Higher Education and Skills). Furthermore, since he served as Minister of Industry of the Republic of Indonesia in July 2016, Airlangga focused on increasing the added value of the industry and creating a business climate that supports business actors. "In addition to encouraging innovation, along with Indonesia which is preparing its manufacturing sector to enter the era of Industry 4.0," he added. As an experienced businessman, according to Eddie Teo, Airlangga is also able to encourage synergy between the public and private sectors to create a positive industrial ecosystem for Indonesia. "Therefore, Mr. Airlangga's presence to Singapore is expected to open new areas for discussion and cooperation that will benefit both countries," he concluded.